I was perusing the World of Warcraft (WoW) general forums the other day, reading some of the upcoming changes coming in the Cataclysm Expansion. Nothing too crazy, and a lot of what was there I didn’t care about or had already caught wind of. After all the class changes, I went to the Cataclysm Stat & System Changes thread. Weapon Skill – This stat will be removed from the game completely. Classes will start with all the weapon skills they need to know and will not need to improve them. I’ve just learned that come Cataclysm, battlegrounds will no longer be limited to servers from a particular battlegroup, but rather, a region. I mean… holy s**t! We’re currently expecting both normal and rated battlegrounds to be cross-battlegroup (within a region) for the launch of Cataclysm. So, players queueing from anywhere in north america (for example) could play vs players on any north american battlegroup, etc. This applies to all regions, not just north america. Also, read this post over at WoW.com. My first ever WoW screenshot. I felt very proud at this moment, having ventured out upon the bowsprit of the boat from Darkshore. I was also into my twenties and feeling very capable. Sadly though… Delilah, my Moonstalker Runt and first pet, was eventually kicked to the curb in favor of Broken Tooth. Her only trace of existence being this screenie right here. Q. Will there be any new pet families added, or will we simply see more additions to existing ones? A: We’re not sure yet whether we’re adding new pet families or not. It’s possible. Expect to see some monkeys, foxes and other new pet possibilities though! Q: Does the Marksman mastery (Double Shot) work like the Wild Quiver talent (provide a free autoshot) or like the Lightning Overload talent (a free whatever spell you just cast)? In other words, can Double Shot fire a second Chimera Shot? A: Double Shot is a half-strength autoshot. Wild Quiver will increase the damage of the autoshot to 60-70% (or something similar). Lightning Overload (the talent) will likewise increase the magnitude of the Elemental Overload mechanic. More pet possibilities! Woo hoo..! Last year, Blizzard had also mentioned making some existing non-hunter beasties tamable, such as Zhevras. My initial reaction to the Masteries, is that Marksmanship’s is the weakest. The BM Mastery looks great, as does Survival’s. BM receives passive boosts to pet damage, plus faster haste regen. SV gets a buff to all “elemental” attacks, along with a higher passive crit rate. Don’t get me wrong… I think the passive Zod’s effect for MM is pretty cool, it’s just my least favorite of the masteries. I prefer to have a mastery that’s not dependent upon RNG, or hindered by movement-heavy encounters. As I always say though… Cataclysm’s a ways off, so we’ll just have to wait and see. No sense in getting ruffled just yet. Who knows… maybe the proc-rate on Double Shot will be quite generous, and maybe hunters will have more stand and shoot types of fights. There are a lot of negative nellies out there really poo-poo’ing this change. I really don’t think you can come to an accurate conclusion on this new mechanic just yet. For one, we have no way of knowing how other factors will play into our focus regen and management. All we know is the base cost of shots, along with the base focus regen rate. Given those two things, it looks as if we’re going to be reduced to stationary focus-starved ranged DPS’ers. However, what we don’t know is how talents, abilities, stats and various buffs will play into the equation. Once talented, there’s no doubt that all of the shots will have their base focus costs reduced. Also, it’s very possible that focus regeneration rates will be much higher than the base 6/sec. once talents, gear and buffs are taken into account. 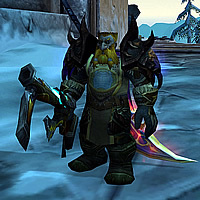 Hunters are one of the most popular classes in WoW, so it’s highly doubtful that Blizzard would intentionally “destroy” the class. Give this new mechanic some time to develop, and for all you downer donnas out there… FFS, quit yer bitchin’!